A benefit of someone else using my camera to photograph the event is that I got to keep the photos. To further throw people off the scent, I posted a photo in my blog post Rideau Canal Skateway now open for 2012, in which Alistair and I were both pictured (he's probably composing the tweet above). I mean, why would people have reason to suspect I was in the shot when it was clearly not taken by the patroller in the photo? Why did I care so much about the secrecy? The more selfish reason was so people wouldn't pester me for inside information like when the canal was going to open, but the more practical reason is so that I could post about the Canal on my blog and Twitter without being mistaken as speaking in any sort of official capacity. I was the president of a community association at the time, and I wouldn't want the opinions I expressed in that role to be conflated with my position on the canal. So when preparing my 2012 blog post, I deliberately picked a photo where my face was obscured by the Ice Hog mascot's waving hand. I was worried that people might still recognize me by the water bottle hanging from my belt, so I took the extraordinary measure of photoshopping out the bottle in the version that I posted in 2012. I attended the opening ceremony for the next couple of years, though as you can see in the 2013 photo above, I no longer went up to the flagpole. Nor did many photographers from the media. With all due respect to the NCC, and as Alistair's 2012 tweet suggests, the flag-raising event is pretty meaningless. The canal, and the many people using it, is one of the most picturesque parts of Ottawa and the last thing a news media organization needs to illustrate the fact that the canal is open is a photo op of bureaucrats who are not skating, or even standing, on the actual canal. During my time on the Skate Patrol, Ontario introduced a new statutory holiday, Family Day, which falls on the third Monday of February. Since Winterlude is always on the first three weekends of February, this new holiday lines up well with the final weekend of Winterlude, which became three days long, i.e. Saturday, Sunday, and Family Day. 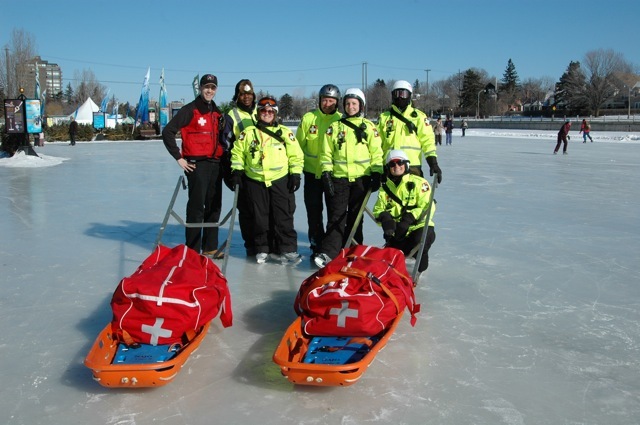 It took the powers that be some time to realize this, and for the first three years of Family Day, starting with 2008, the Skate Patrol was asked to staff it like a regular weekday (i.e. 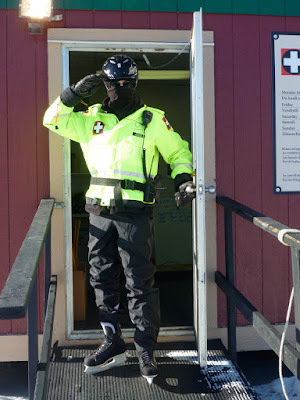 two sequential shifts of four patrollers from around noon to 10pm), until it was just a few days away and we were asked to staff it like a weekend (i.e. five overlapping shifts of four to six patrollers). I remember one guy did a triple-shift one year on Family Day to help cover the work. Weekends are always busy for calls, and Winterlude weekends, including Family Day, are insane. I can recall one day when I got back to the Skate Patrol trailer after dark with my sunglasses still on because I was so busy tending to calls that I never had a chance to retrieve my regular glasses! 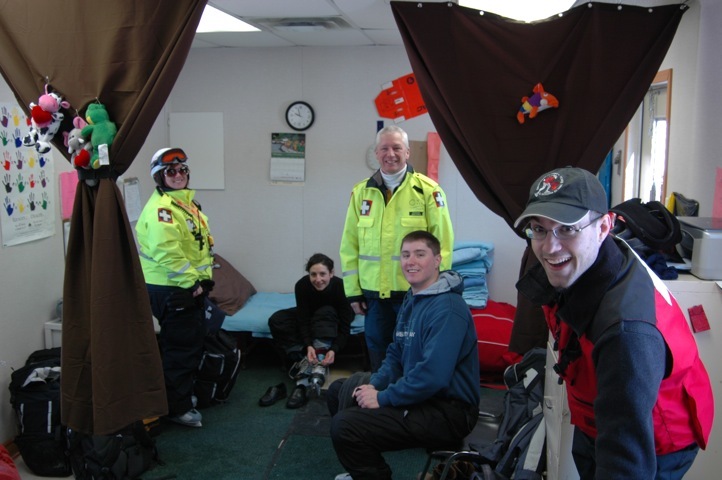 To give a sense of the crowd, here's a shot of some patrollers tending to a patient by the Mackenzie-King Bridge on the last Saturday of Winterlude, 2011. I had the honour of being the supervisor for that shift, and I got quite a rush out of it. Supervisors get to wear the red vest—the only holdover of the pre-yellow-jacket uniform I described in Part 1. As with on-ice patrolling shifts, evening supervisor shifts can be very quiet, mostly catching up on paperwork. 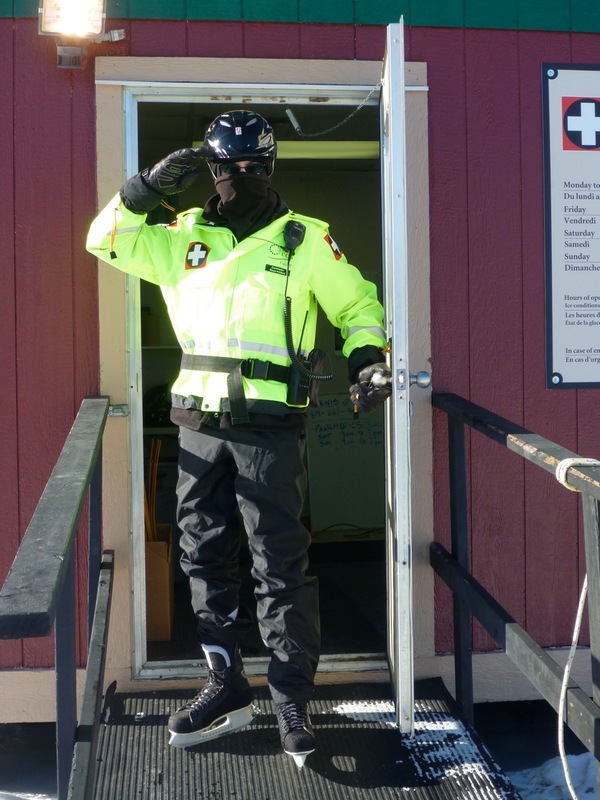 But during weekend daytime shifts I would constantly be on my feet as a supervisor, tending to walk-in patients, collecting paperwork from patrollers, answering the phone, and moving markers around a magnetic wall map of the Canal to track patrollers and incidents. There was one particularly busy Winterlude dispatching shift that I'm really proud of. I don't recall the exact details, but it went something like this: an Ottawa Paramedic Service supervisor was in the Skate Patrol trailer, tending to Paramedic business, whilst I was on the radio coordinating with our team about a number of simultaneous incidents all in one section of the canal: One team of patrollers was with a patient near Bronson Avenue waiting for the Bobcat to transport the patient back to Skate Patrol for transfer to an ambulance; however, the Bobcat paramedics, on their way to that transport call, came upon another person with an arm injury. Meanwhile, someone phoned in to report another injured person on Dow's Lake. 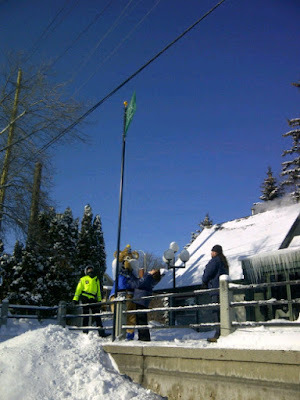 Yet another team was just finishing up with tending to a fourth patient at the 4.8 kilometre marker. In quick succession, like a sliding puzzle, I dished out instructions over the radio: the latter patrol team would go to the Bobcat's location to take care of their lower-priority arm injury to free up the Bobcat to pick up the transport patient, thus freeing up the patrollers at Bronson to tend to the Dow's Lake call. Whew! After radioing all relevant parties the necessary instructions, I could step back from the map and take a breath before the next challenge. The paramedic supervisor, whose regular job is dealing with emergencies, was clearly impressed by my rapid-fire dispatching. He looked at me and said something along the lines of, "wow, I do NOT want your job!" By 2014, the year Winterlude (but not the skateway itself) was transferred from the NCC to the Department of Canadian Heritage, I didn't do any full shifts beyond an appearance on opening day, to stake a nominal claim on the milestone tenth year on the skate patrol. I could then say that I've been around longer than any other patroller who worked that year (in my first couple seasons, there were some people who had been around since before Lafleur took it over, so there are definitely people who've done it even longer than my ten years!). I helped out a bit here and there when I came by for a skate, but that, for the most part, was it. A new shroud of secrecy cast by the NCC in 2015 meant that I wasn't told of the Canal's opening date that year. With that, I realized that I was now a civilian, and that both my skate patrolling career and my opening shift tradition were both over. So, since I no longer have to worry about dodging questions about when the canal will open, and my roles on the Skate Patrol, the CCCA, and at City Hall are now all behind me, I'm comfortable with letting you all know that I was on the Rideau Canal Skate Patrol. I'm proud of my time there, but it's in my past now. One of the things I've always enjoyed about the Rideau Canal is that it's absolutely free, so everyone can participate (even if they're just walking). Although the change huts and concessions close overnight, you can go out on the canal at any time, day or night, in contrast to so many touristy activities that shut down at 5pm. Oh, and if you happen to get injured, there's a team of very professional Skate Patrollers who are around to help you out. This is the third and final part of a three-part blog post about my ten years on the Rideau Canal Skate Patrol, from 2005 to 2014. I'm not sure how much blogging I'm going to be doing, but I do have a 3D project in the works that I'm very excited about. I'll post more when I have details.